Brides for a Cause had the opportunity to be a part of a locally produced independent film, Zilla and Zoe. 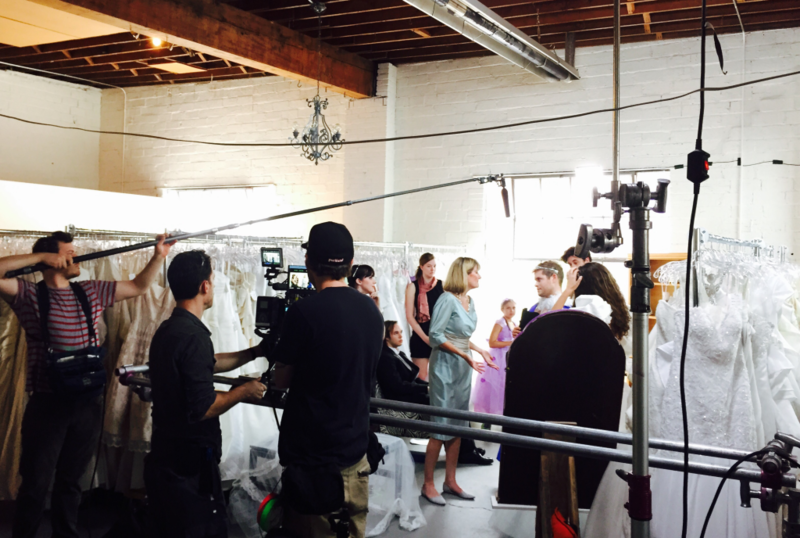 Summer 2015, we opened up our boutique to the crew, so they could shoot their bridal store scene! A new local director debuts her Kickstarter-funded comedy, Zilla and Zoe. So you might guess that Zilla and Zoe, which premieres privately at the Mission Theater on Friday, is a millennial splicing of Bride Wars and Carrie. Yet according to Scalise, the film is something else entirely: a family saga set in Portland that’s joyous, realistic and eccentric. After completing the Zilla and Zoe script—which was a quarterfinalist in a contest hosted by San Francisco’s Zoetrope studio—Scalise filled out the cast of two dozen actors with the help of Portland’s Cast Iron Studios and raised money online to fund the movi. While Scalise gathered enough cash to shoot the film, she knew it wouldn’t power the production past the final day of shooting, which forced her to use Kickstarter to raise the funds necessary to complete the post-production process. About 150 people pledged money to the film on Kickstarter, resulting in a total of $20,000. The result is a film that looks more expensive than it is, which is also thanks to cinematographer Sean D. Brown, who shot the film on a RED Epic Dragon camera. With Zilla and Zoe now ending one phase of its journey, Scalise says, with a laugh, that she tries to suppress her recollections of the more stressful moments of making the film, which required her to stage a brawl in Brides for a Cause, a bridal shop, using child actors. And as far as the movie’s future beyond the horizon of its Friday premiere at the Mission Theater, Scalise is looking forward to screening the film at festivals before securing it a wider release. For now, Scalise seems to relish not only having completed Zilla and Zoe, but having directed a movie that uses iconic Portland locations like Voodoo Doughnut and the Peculiarium. She may have grown up in Oakland, but Scalise seems enraptured by Portland and says that some of her favorite parts of the film to shoot were the scenes set in Sal’s truck, which gave her the opportunity to ride around the city. She even features a quintessentially Portlandian flourish in the film—a scene in which Sal walks grumpily past a guy who’s wearing a lemon-yellow beanie and a fur coat and carrying a “Keep Portland Weird” sign.